Loctite is a specific brand of threadlocker. A threadlocker is a thin anaerobic adhesive that, when it cures, helps to “lock” threads into place. It cures as part of a chemical reaction with metal surfaces that takes place when no oxygen is present. That means that it will cure once you tighten the bolt. To cure, however, the bolt needs to be clean of grease and oil -- otherwise, the adhesive won’t come into contact with the metal to start the curing process. Threadlockers (like the ones made by Loctite) prevent corrosion and rusting of the threads, which is a common cause of problems when it comes time to remove a fastener. 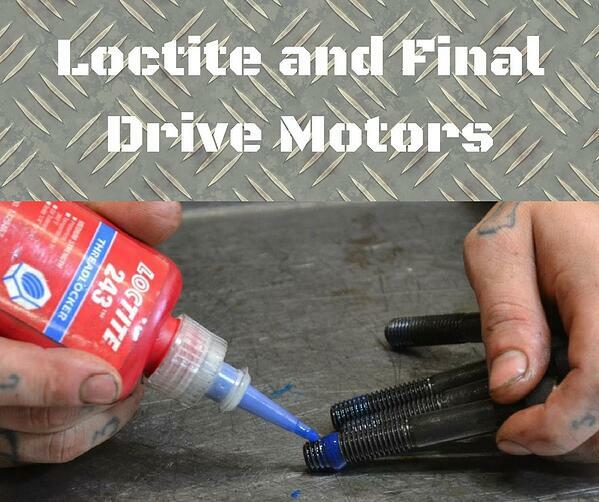 Loctite Threadlocker also prevents loosening due to vibration or shock loads. It also helps to stop thread galling, which can make a bolt almost impossible to get loose. When using a threadlocker correctly, you don’t have to worry about bolts working loose or getting corroded. You probably noticed that Loctite helps keep bolts from loosening due to shock loads and vibrations -- both of which are common occurrences during the lifetime of a final drive motor. 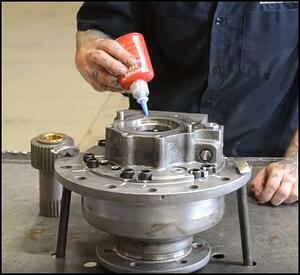 It also prevents rust, and we all know that the exterior of a final drive will get rusty during use. We use Loctite threadlocker a part of our commitment to high-quality work. If one extra step in the assembly process can keep your bolts from coming loose and getting rusty, then it is worth it to us. At Texas Final Drive, we use Loctite Threadlocker Blue 243 Nut and Bolt Locker. As mentioned earlier, it protects threads and locks the threads. What makes it different from some of the other types of Loctite is that it locks the threads tight but the fasteners can still be removed with hand tools (e.g., you won’t need a welding torch to get them loose). This type of Loctite Threadlocker is specified for removable fasteners with a diameter between ¼” and ¾”. It works with nuts, bolts, and set screws. If you use a stronger type of threadlocker, then you will have to have heat in order to remove the fastener -- which isn’t a good idea for final drive motors. We like to pass on tips that can help you provide your final drive with the care and maintenance it deserves. That’s why we wanted to explain to you why we use threadlocker on the bolts and set screws in your final drive motor when performing repairs or a reman.